The idea of this page is to explain all items relating to sails, sailing and the running rigging. Although the old sails weren't in bad condition when we purchased Rosie, one ripped during our Maiden Voyage. We replaced them with a brand new set and kept the Main and 90% High Clew Yankee as spares. These are currently located in a hard to reach spot in the engine room. Main Sail:The new main is a fully battened heavy duty sail with three reef points cut into it. It has not had much heavy weather sailing and still looks and handles like new. The halyard is led back to the cockpit as is the main sheet. Other control lines for the main sail are the traveler which is controlled from the cockpit on a 6 block pulley system and twin preventers which are also controlled from the cockpit. When the staysail is not in use we put these on the rear winches and when it is in use we just use one of the many cleats back there. We get tension on the line by the 3 way pulley and when that is not enough we slacken the main sheet, attach the preventer and then snug up the main sheet. We have no boom vang, preferring to just use these preventers to pull the sail down and shape it. (I tried twice to install a boom vang - since I thought a boat should have one, rather than us needing one - and due to the angles and forces involved I exploded two sets of blocks before I gave up). Having permanently rigged preventers makes for safer sailing by removing the danger of an accidental jibe. Many of our cruising friends indicate that they never rig a preventer unless they plan to sail by-the-lea for a period of time, leaving those occasional times thwart with peril! Main Sail Reefing: After our fateful Maiden Voyage, one of the first things I did when we purchased the boat was to move all the reefing control lines back to the cockpit. This involved many turning blocks and cheeks and the addition of 8 clutches and a winch under the dodger. A lot of work and expense but in our opinion time and money well spent. With the new system we (Kelly can happily reef the main without waking me) can throw in a reef in under a minute and shake one out even faster. When sailing with friends of ours on a bigger boat we typically overtake them at night since they reef at sundown 'just in case' (it takes them more time plus two people), whereas with reefing being so easy we wait until the wind picks up before reefing. We have 6 lines for the three reef points, three tack and three clew. They are color coded, yellow - reef 1, blue - reef 2, green - reef 3. Tack and clew for same reef point are the same color. All the tack lines are on the stbd and the clews are on port. The tack lines go from the cockpit to the mast base, via a few blocks on the mast through the cringle and are tied off on the far side of the mast. The clew lines go from the cockpit to the mast base then they travel up and inside the boom to the end, from there they go through the clew grommet and are tied off on the boom. If hard on the wind, ease the main sheet slightly. If running, turn up into the wind slightly. Idea is to relieve some wind pressure on the sail. Throw the coiled main halyard on the cockpit sole and put two turns on the winch. Release the main halyard clutch keeping firm pressure on the line so it does not drop the sail. Also release all tack reefing lines above the one you are putting in, i.e if putting in reef 1, release reef 2 & 3 etc. Next in one fast fluid motion with left hand let out one meter (or two if long arms) of halyard and at the same time with right hand pull in the same amount of all reefing lines above and including current reef, i.e. if putting in second reef pull both blue and green simultaneously. Three such rapid exchanges and the reef line you are putting in will not go any further. The halyard will also have a mark on the line. Stop when the pen mark just comes through the clutch. Close remaining tack clutches and snug up lines by hand. Now we can switch sides to the port and work on the clew. Pull all lines above and including the reef you are putting in, i.e reef 2 pull blue and green. When you can pull no more put the reef line you are working on on the winch and winch until the mark shows through the clutch. Perform visual sail inspections as you are winching to ensure no snags. Snug up the remaining reefing lines by hand. Trim back in the main sail/adjust course as appropriate. We have found that coiling all three reefing lines as one without hanking them and laying them under the dodger works well for both tidyness and speed of use. We coil the main halyard without hanking and lay it to the left of the clutches so you are ready for item 2 above. The above seems overly complex but when you remove the words and analyse what you are doing it is simple. Release the halyard and firm up the tack then firm up the clew - done. Release all clutches not in use. i.e. if you have two reef points in, release the two green lines, if you have one reef point in, release the 4 blue and green lines. Nothing should happen. Release the tack of the current reef point. The sail will go very loose and depending on the wind conditions may flog a little. Winch up the main halyard to the next mark. Any prior reefs will now be already set or you will have the full main up again. Coil all reefing lines as one and coil halyard, lay under dodger ready for next time. Again to simplify, release required clew, then tack and winch up - Done. Yankee: We only have a 90% Yankee as our head sail and have been very happy with its performance. Any larger and for most of our conditions we would have had a permanent reef set and hence lost efficiency. If we did ever need more sail it was Jennaker conditions. It has a high cut clew ensuring that if you have it poled out in rocky seas it will never go in the water like a few of our friends experienced. Trimming is as easy as lining up the tell-tales on the windward and leeward leading edge. The sail is on a Profurl roller furling head stay and has black Sunbrella uv protection strip. This strip needs a small amount of sewing where the stitching has worn away but is otherwise in great condition. This boat is truly a head sail driven boat, with just the main up she will barely move but just a jib and she is flying. When we are hard on the wind (Rosie sails great at 45 degrees apparent, she can sail higher angles but her speed falls off quickly) and start to heal too much we reef the main first, in fact we don't think about reducing head sail until we have three reefs in the main. Staysail: When we purchased the boat she had a hank on staysail with a boom and it just seemed like too much work for us lazy cruisers. Also I had read about how dangerous a staysail boom can be in bad conditions. Before we left I replaced it with a Harken roller furling system and purchased a new sail to go with it. The old sail we ditched as we no longer had a stay to mount it on. Due to the placement of the sissy bars I could not run the lines as I wanted to the cabin top and hence just went to the toe rail. The sail gave such poor performance due to the direction of pull of the sheets that I was forced to go out and purchase a new boom (I had disposed of the old one). 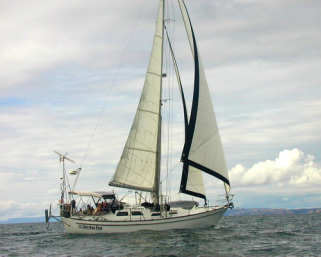 The new arrangement lasted for a few years but I was never totally happy with the solution a) We could not leave the dinghy inflated on the fore deck b) the new staysail was slightly too long and we could not get it flat enough when hard on the wind without hitting the sissy bars. We met a cruiser with the identical boat to us "Gypsy Soul" and Ben showed me his tweaker solution (I guess Barber Hauler is the official term). He, like me, had the sheet going to the toe rail but then a second line going to the mast base gave the sail shape. I thought it worth a try. I had to devise some special hardware to mount a block at the base of the mast and have it not interfere with the mast mounted spinnaker pole. I have never gone back to the boom although I have been burned once by getting rid of something too soon so I still carry it, just in case. If you would prefer the convenience of a self tacking staysail then you are ready to go however the sail will have to be slightly shortened for perfect trim. The sheets to the staysail are led to the aft cockpit winches and the tweaker comes back to the stbd set of clutches. Trimming the sail requires you to visualize where you want the clew to end up and then trimming in a little sheet and a little tweak to achieve the required position. Tacking is easy. You just tack the boat as normal dealing only with the jib then when you are finished release the staysail sheet and winch in on the other side. If you are following a reciprocal course then the tweaker will be already set. The furling line is the black line lead to the stbd cockpit combing cleat. The stay sail works well with the yankee upto 200 degrees apparent, after which it blankets the wind and has a detremental affect. It is really surprising how much extra speed you get by unfurling this sail so don't get lazy and just use the head sail; this boat is called a cutter for a reason. Jennaker: My favorite sail, a modified spinnaker, deserves a page and a name all herself. "Jenny". Spinnaker Pole: Anywhere from 130 degrees apparent we will pole out the jib, Rosie sails more in balance and faster than on a broad reach. Even in extreme wind conditions Rosie prefers the balanced approach of wing on wing even if we only have 3sq ft of sail showing. The pole is mounted on a mast track and is very quick and easy to deploy. Once again I will go through my step by step approach to using it. If you are a sailor you will probably laugh, if not I hope my notes are useful until you develop what works for you. Place a block as far forward as you can on the toe rail, a second one on the toe rail next to the jib fairlead and a third one on the toe rail at the shrouds. Attach the halyard that lives on that side of the boat to the end of the pole ensuring it is on the outside of all other lines. Remove the pole from the deck chock (you may have to lower the but lift line holding up the staysail tweaker block but normally standing on it does the trick) and clip on to the top life line adjusting the halyard and mast track to relieve strain off the life lines (track has lines to adjust position of pole on mast). Using the black and white striped line - usually kept on the sissy bars but will probably be stored in the lazarette when we return to port - tie the point 2/3 from one side and 1/3 from the other to the end of the pole in a big bowline through hole and around pole. Lead the longer side outside everything to the bow block then back along the deck through the shroud block and tie off on a cockpit combing cleat. Lead the other side outside everything to the aft block and onto a second cleat. Run the jib sheet through the end of the pole and back through its fairlead to its winch. Raise the pole halyard and lower down the mast track adjusting the guy as you go, until it looks horizontal and at the same height as the jib clew. You are now ready to winch all or part of the jib onto the windward side of the boat. 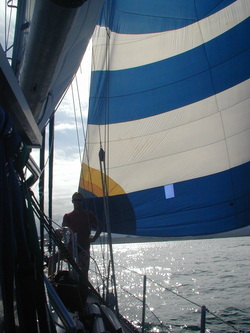 Notes: With the sail fully out on one side the opposite sheet may have to be cast off the winch and either tied to the life line or rest on its stopper knot in the fairlead block as the line may not be long enough.Sometimes wing on wing, pulling the staysail out on the same side as the main to 'fill the gap' adds to the boat speed.As of yet we have never used the pole in conjunction with the Jennaker however it should work fine either as a poled out head sail or in a true spinnaker configuration with the pole at the tack. Have fun playing.If the wind is getting squirrelly and keeps backing the head sail leave the pole out and pull the sail to the other side so you are ready to try again later. We occasionally set the pole before leaving on a voyage in anticipation of wind direction, we can have the pole out for a week and never use it!